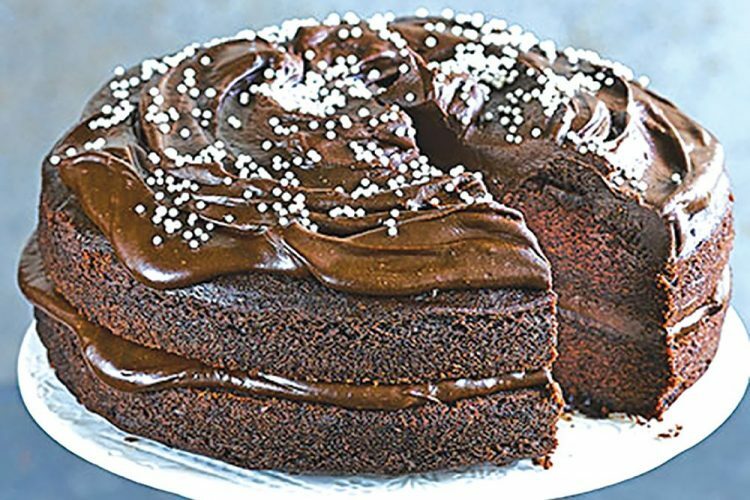 This is the moistest chocolate cake I have ever done, and believe me I have tried a few. Preheat oven to 350 degrees C. Break chocolate into pieces. Place in a small saucepan with 1/ 3 cup water; stir constantly over low heat until melted. Cool. Cream butter and sugar in a mixer until light and fluffy. Add eggs and vanilla; beat well. Mix in chocolate. Combine flour, baking soda, and salt and add alternately to cake batter with 1 cup water. Pour batter into well-greased and floured cake pans. If you are using two 8â pans, bake for 35-40 minutes; two 9â round or square, pans, bake for 30-35 minutes. Remove from pans and let cool completely, frost if desired. Tips â I reduced the sugar to 1 3/4 cups. Chocolate substitution â melt 1 tbsp butter then stir in 3 tbsp unsweetened cocoa until dissolved. Cake flour substitution â 1 cup cake flour = 1 cup minus 2 tbsp all-purpose flour, plus 2 tbsp cornstarch. I let the 1/4 cup flour stay as is.